Please Click here to view a video address by Sister Charmaine Krohe, provincial leader of the Atlantic-Midwest Province to ministry boards for the Lenten season. 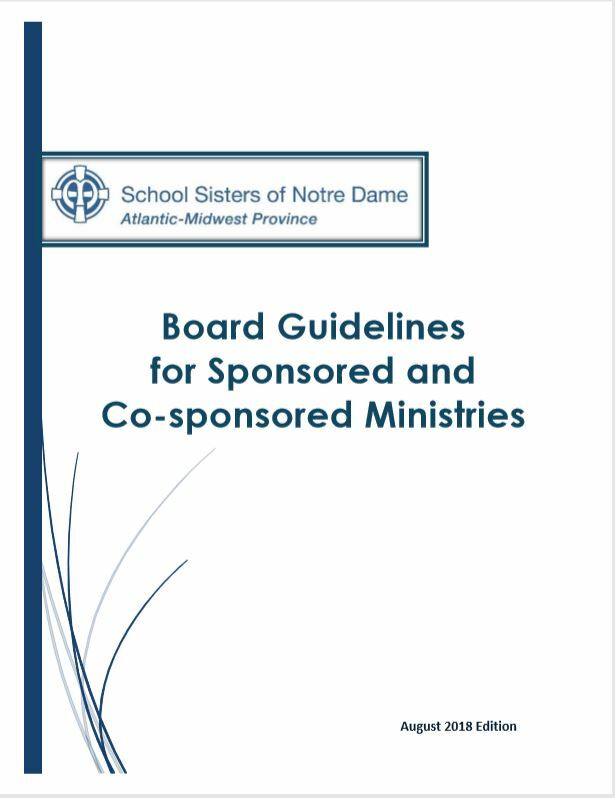 Click here to access the newly released 2018 Edition of Board Guidelines for SSND sponsored and co-sponsored ministries. Please contact your council liaison or email Sister Grace D’Amico (gdamico at amssnd.org), SSND with any feedback or questions you might have. Below please find a variety of resources in support of your service on an SSND ministry board. They consist of spiritual resources to place the board meeting in an SSND context and vision; they are educational resources to assist new board members to familiarize themselves with the SSND history and heritage; they are tools to guide, strengthen and maximize your engagement on an SSND ministry board; and they list upcoming webinars for board development. Please email the Department of Ministry Services (ydebruin at amssnd.org) if you have particular resource needs or if you have resources to share.